micah (Micah Cohen, politics editor): With former President Barack Obama’s return to the campaign trail in the last week or so, here’s our overarching question for today: Who does Obama motivate more in 2018, Democrats or Republicans? I’m thinking first we talk a bit about what we know about Obama’s sway among Democrats. Then we dive into his standing among Republicans. Then we see how they compare. Sound good? nrakich (Nathaniel Rakich, elections analyst): But I have numbers, Micah. Numbers that will obviate the need for this chat in the first place. micah: $100 says that’s not true. In any case, to start with what may be a dumb question: Democratic voters love Obama, right? clare.malone (Clare Malone, senior political writer): Well, his role seems to be that of elder statesman and moral force. Most Democrats seem to be ignoring for now that they really hated (or were at least less than thrilled with) some of his policies … drone strikes and some immigration policies, for example. But the Obama-is-above-reproach sentiment is en vogue for Democrats right now because there’s lots of stuff to reproach President Trump for. Obama’s very feel-good. perry (Perry Bacon Jr., senior writer): According to the Pew Research Center, 51 percent of Democrats say Obama is the best president of their lifetime. That’s way above Bill Clinton at 19 percent. nrakich: Or, to take a different measure, look at this June 2017 poll by Gallup (the latest I could find crosstabs for): 95 percent of Democrats had a favorable view of Obama. micah: So how do we reconcile those numbers with the tension Clare mentioned? Like … the party does seem to have clearly become more liberal since Obama’s days. clare.malone: I think most voters probably think of him as a lot more liberal than his policies actually were. Obama was a pragmatist in many ways, but he also had an uncanny ability to communicate and be an empath for the moment. nrakich: Yeah, issues are overrated as a determinant of how people feel about politicians — or even how they vote. 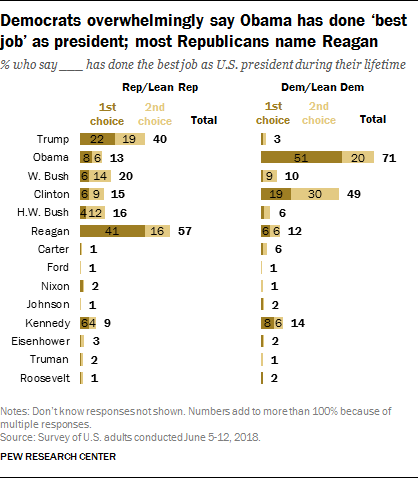 And the party may have moved left, but presidents almost always get more popular after they leave office, and I think that’s the stronger signal here. Obama himself is up to a 63-36 retrospective job approval rating. clare.malone: Issues are always overrated! People vote with their gut. perry: Look at this poll from YouGov. 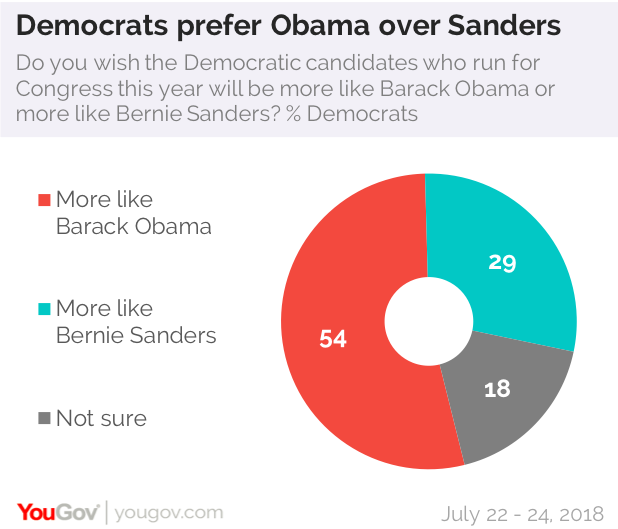 The Obama vision is way more popular among Democrats than the Bernie Sanders one. Those YouGov numbers are really interesting — they sorta suggest that personality is the stronger force even than the “antiestablishment” pull of the moment. nrakich: Isn’t being antiestablishment all about personality? But it’s certainly important to have the rhetoric to back things up. Obama, of course, isn’t antiestablishment anymore. And Sanders is in some ways moving into the policy mainstream. nrakich: Right, but the antiestablishment movement is built strongly on personality. As we’ve said many times, style and approach (the establishment vs. insurgent divide) is different from ideology (the progressive vs. moderate divide). micah: Is no one else surprised that Sanders gets less than a third there? That’s worse than he did in the 2016 Democratic primary. perry: I was surprised by the Sanders number. I would have guessed something like 40 percent of Democrats would have preferred the Sanders-style candidates to Obama ones. Sanders is extremely popular among Democrats. micah: IDK, maybe that poll result is more about Obama’s near-deity status in the party more than any problems with Sanders. perry: Yeah, Obama is a deity among Democrats. I think that’s right. And Bill Clinton has the #MeToo problem now and Hillary Clinton lost, so he’s not in as strong of a position as Obama in terms of ex-Democratic presidents able to help the party in the future. I also think the median Democratic voter is not particularly supportive of ideas like “abolish ICE” and has more establishment/centrist views, like Obama. clare.malone: There is anger out there, though. People have a lot to be angry about in the post-financial-crash world. And Sanders is good at evoking it. Obama made history, and it’s hard to not like that if you’re a Democratic voter — and also, to Perry’s point, he doesn’t have personal problems that will tarnish him. And he’s young and will be a force in the party for years. I think that’s probably comforting on some level to people. perry: Democrats favor abolishing ICE by only 43 percent to 34 percent. Obama is personally way more popular with Democrats than abolishing ICE is. perry: I would start by saying that most Democrats are pretty motivated already. nrakich: I don’t know, Perry. I feel like Obama could help at the edges — say, with African-American voters, whose lower turnout was a problem for Democrats in 2016.
micah: Obama campaigned with Clinton, Nathaniel! Micah and I are making the same point. We will be more polite next time. We love you. clare.malone: Shameless plug re: black voters and Jones. nrakich: I am open to the argument that campaigns just don’t matter all that much. But then, again, that would mean there’s no more need for this chat! micah: I think it matters, but the effect is just more marginal? 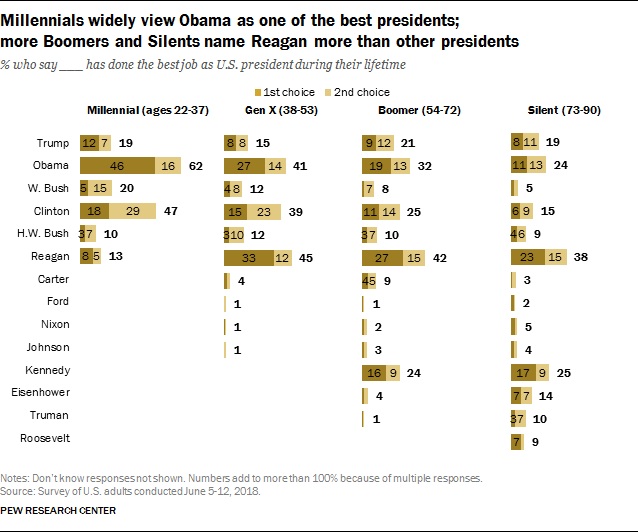 perry: Obama is really popular among millennials (of all parties, although millennials lean to the left). So he could help turnout among that group. clare.malone: Because millennials like to watch inspiring viral videos on Facebook and Obama is great fodder for that. He’s perfect for a generation of people or an era of politics that’s Upworthy-ish, right? He pulls on emotion. micah: And he could definitely help the specific candidates he campaigns for with 💰 too? perry: Yes. And media attention. Like I’m sure those House candidates in California were happy to have him Obama come to campaign for them. So I don’t think Nathaniel is wrong — I think Obama can be a help. micah: But on the margins. clare.malone: Here’s a question: Will whoever turns out to be the Democrats’ 2020 front-runner need the Obama benediction? perry: What do you mean by benediction, Clare? And do you mean in the primary or the general? micah: I don’t think he’ll endorse in the primary, though. clare.malone: Yeah, or will he stay out of the primary and not tilt the scales and adjust after? perry: If it’s down to Michael Avenatti vs. Joe Biden, Obama endorses Biden. I mean, Obama all-but-endorsed Clinton in 2016, and I would assume that helped Clinton with black voters, a group she overwhelmingly won in the primary. micah: But what if it came down to Sanders vs. Elizabeth Warren? micah: Or Sanders vs. Biden? nrakich: If it’s Sanders vs. Biden, he’ll do what he did in 2016.
clare.malone: I’m not sure he won’t endorse … he probably won’t. But he was reportedly very interested in the shadow primary of the Democratic National Committee leadership election … getting Tom Perez elected, etc. He cares about the party direction. nrakich: Yeah, Clare, I generally think ex-presidents are a little too cautious/tradition-bound about sticking their necks out. Why shouldn’t Obama be a little more muscular about the future direction of the party? His legacy is on the line. micah: I think Sanders is more mainstream now than he was in 2016, so I don’t think Obama could do the same thing again. perry: If it’s Sanders vs. Biden, Sanders might win. And I don’t think Obama wants to be on the losing side. nrakich: But he’ll still have plausible deniability because he didn’t formally endorse. I assume he would say something like that. nrakich: Look, it’s not rocket science. Obama has a 63 percent approval rating. That has to include a big chunk of independents and at least a non-trivial number of Republicans. According to the 2017 poll I referenced earlier, Obama was seen favorably by 22 percent of Republicans. That’s not awful. micah: That’s better than I expected, actually. nrakich: And, according to a Gallup poll from February, 38 percent of Democrats now approve of George W. Bush! Some of that is the Trump effect, but in general, partisans cool their jets once their mortal enemy stops being their mortal enemy. perry: So the data suggests that unlike 2006, 2010 and 2014, both the opposition party and the president’s party are pretty motivated. I think GOP enthusiasm is already high, as conservatives view this election as defending Trump. And that was before Obama got more involved. nrakich: The bottom line is that Republicans don’t love Obama, but they don’t hate him the way Democrats 💖 💜 LOVE ❤️ 💓 him. perry: I do think Obama has to be somewhat careful about where he campaigns. My guess is that his approval rating is higher with California Republicans than Georgia Republicans, for example. I don’t have data to prove that, but it’s my intuition. I’m basically saying, Obama should look at his personal approval rating in each state or district. If it’s above water, campaign there. If not, don’t. perry: Amy McGrath, the Democratic candidate in Kentucky’s 6th Congressional District, should not have Obama campaign for her. micah: Wait a sec, Nathaniel — you think Democratic ❤️ for Obama > Republican 😠? We talk a lot about Trump’s “strongly” approve and “strongly” disapprove numbers. Basically, a lot more people strongly disapprove of Trump than strongly approve. For Obama, at least when he was leaving office, it was the reverse. The same pattern shows up in other polls, like Rasmussen and YouGov. micah: Wow. OK, so that suggests that more Democrats strongly approve of Obama than Republicans strongly disapprove of him? nrakich: Yes. In the WaPo/ABC News poll, 77 percent of Democrats strongly approved of Obama on his way out the door; 60 percent of Republicans strongly disapproved. micah: And those numbers, if anything have probably gotten better for Obama in the time since. nrakich: And don’t discount the independent 👍. micah: Those 🔥 takes are stupid. Or, at the least, the evidence suggests (if anything) the opposite. nrakich: With swing voters, especially 2018’s swing voters, Obama is probably pretty popular. perry: And he presumably has some appeal with Obama-Trump voters too. And I have no data to back this up, but I bet Romney-Clinton voters are pretty favorably disposed toward him too. They may not have voted for him, but they’re the kind of genteel suburbanite who probably misses his even keel. clare.malone: OK, so let’s move out of numbers for a second and say that in practical terms this means what? That Obama must choose over the next months (and years) where he campaigns based on what? The basic approval numbers of Democrats? The tentative approval numbers of Obama-Trump voters? Does he leave states like Alabama to more local pols who can turn out, say, the black vote, without turning it into a national thing when he visits? I think he’s got an interesting thicket to pick through. perry: Sen. Cory Booker, not Obama, went to Alabama. And that was probably best for Jones. My guess is Kamala Harris/Booker/Sanders go to Georgia, and that is best for Stacey Abrams. micah: I guess all these numbers make me think it’s less of a thicket than I originally thought. But still a thicket, of course. nrakich: Right. I think someone (you, Perry?) put it well in an earlier chat: Send the mid-level pols who will get coverage/chatter in the circles you want, like the campus newspaper or the local black community, while not breaking through into the mainstream coverage that reaches everyone. A visit by Obama would get state- or district-wide coverage, which would probably hurt Democrats in a state like Alabama or Georgia that are still majority-Republican. micah: Would you send Obama to Obama-Trump counties? nrakich: If I had the resources, I would poll them to see how his image there is holding up. clare.malone: Well, he’s going to Cleveland to stump for Richard Cordray, who’s running for governor. perry: So the answer is yes. clare.malone: A mostly black part of the city. But, yes, Ohio. He’s not in, say, Youngstown. perry: Yeah, Iowa is very white and I think sort of old. nrakich: Take Iowa. I think he probably wouldn’t hurt Democrats there. He did, after all, win there six years ago. But to our earlier point, I think he helps Democrats more actively in more base places — areas with lots of millennials, nonwhite voters, etc. nrakich: I think, in general, we shouldn’t overthink this: Obama is quite popular and therefore would be an asset on net. But it definitely depends on geography. perry: Obama will be an interesting case. He is popular. He is young. He will be able to campaign for Democrats for years and years. His presidency was not considered unsuccessful (like Jimmy Carter’s was). His wife is not planning to run (like Bill Clinton’s was when he left office). In fact, Michelle Obama is really popular too. But at the same time, it doesn’t seem like Democrats did very well in 2010, 2014 or 2016, when he was the chief surrogate. It seems like his political magic is in some ways personal to him. micah: Will Obama have a bigger role in 2018 or 2020? 2018 is just the initial proving ground.